The Stanley Pro Lite Hiker Mid is a lightweight, rugged athletic boot. The boot has a soft leather upper with breathable mesh inserts for reduced weight and comfort. The Pro Lite Hiker Mid has a steel toe for protection and a rugged toe and heel leather overlay for additional abrasion resistance and durability. A TPU shank has been added for stability and a soft padded ankle collar and tongue for comfort. 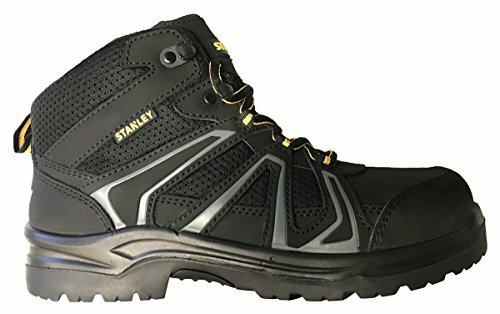 The Stanley Pro Lite Hiker Mid has a special breathable air-mesh lining to help pull moisture away from your feet, keeping them dry and comfortable. A removable PU insole with extra heel cushioning and arch support, helps absorb shock and enhances all-day comfort. An injected PU midsole/outsole absorbs shock, is flexible, durable and lightweight. The outsole is slip and oil resistant. In keeping with the 170-year Stanley history of innovation, quality and craftsmanship, Stanley footwear is guaranteed to offer a level of fit, durability and comfort you would expect from footwear featuring the Stanley name. Comfortable on the clock and stylish off the clock, the Stanley Pro Lite Hiker Mid blurs the lines of work and lifestyle footwear. View More In Footwear & Accessories.